Let's take a look at the tours and campgrounds available inside of Denali National Park in Alaska. Denali Park Road Access Fees for the coming year. Your options for camping in Denali Park are many. You can hike in, take a camper bus in or in some cases you can drive into the park too. Lets look at some of the options and see if there is the option available that makes sense for you. There are a total of 6 campgrounds inside of Denali National Park, each with its own set of amenities. There are 3 campgrounds open to RV's and 2 more open to vehicles for tent camping only. Finally there is the one campground that is just for tents and accessed only by riding the camper buses provided. 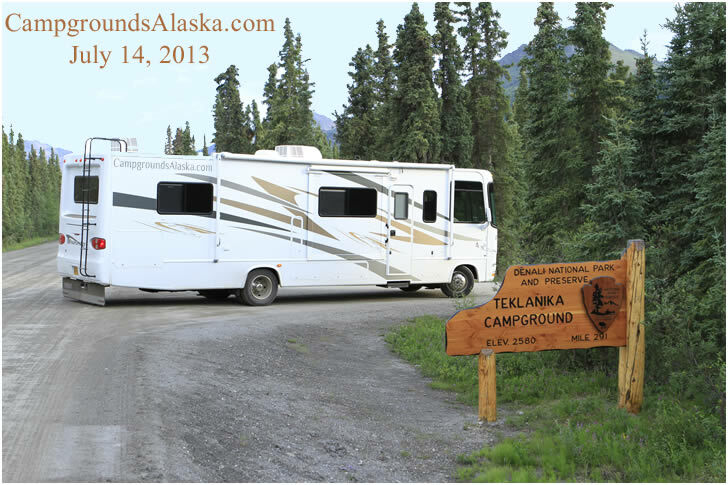 The 3 campgrounds open to RVs along the Denali Park Road. These campgrounds include Riley Creek Campground located at the enterence to the park, Savage River Campground located just prior to the end of the pavement and Teklanika Campground located deep into the park. Each of these choices has some very specific rules, varying services and fees. Tenting is popular in all 6 campgrounds within Denali Park as well as in the backcountry with the appropriate permits. Check with the Backcountry Information Center next to the Wilderness Access Center as you enter the park for more information on backcountry camping and hiking opportunities. You can book a campsite in any of the campgrounds online or at the Wilderness Access Center.